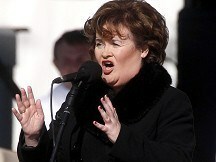 Susan Boyle was given a standing ovation on US TV as she gave the first preview of her new album. The Scottish star returned to America's Got Talent - which gave her a major break across the Atlantic - to unveil new track You Have To Be There, written by Abba stars Benny Andersson and Bjorn Ulvaeus. SuBo, who found success as runner-up in Britain's Got Talent in 2009, is due to release her third album, Someone To Watch Over Me, in November. The song, which came from the songwriters' popular Swedish musical Kristina, appeared to delight the audience for the talent show. She said afterwards: "I'm so pleased the audience enjoyed the song. I really loved performing that big number. I was also a little nervous introducing something new." SuBo added that it was "wonderful" to return to the show, which was created by her record label boss Simon Cowell. Her previous two albums, I Dreamed A Dream and The Gift, have sold more than 14 million copies and simultaneously topped the UK and US charts.